With the holidays yet again closing in and family visiting soon, your fireplace may be the area where everyone gathers. The question is does it need a little more work? Would you finally like to replace those messy charred logs with something that’s new and affordable during the holidays? Not only that, but is extremely easy in maintaining clean when compared to ashy logs or lava rocks. If you’d like to step outside of traditional ways and dive into something modern then choosing fire glass from Glaz Chips is definitely an alternate design solution! Although there is nothing absolutely wrong in keeping traditional methods, fire glass (as pictured above) does have its advantages if you’re looking for a product worthy of replacing. Let’s summarize those perks before giving fire glass an opportunity to possibly make it into your indoor or outdoor fireplace. You be the designer this time by selecting from a wide variety of colors, reflective colors and mixes that will match your exterior or interiors color scheme. Fire glass is thoroughly tempered to withstand the heat of a fireplace preventing it from popping or melting. Doesn’t disperse ash or soot and is easier to clean and maintain when compared to logs or lava rocks. Vibrant colors adds a designer decor element to your fireplace that is eye catching. 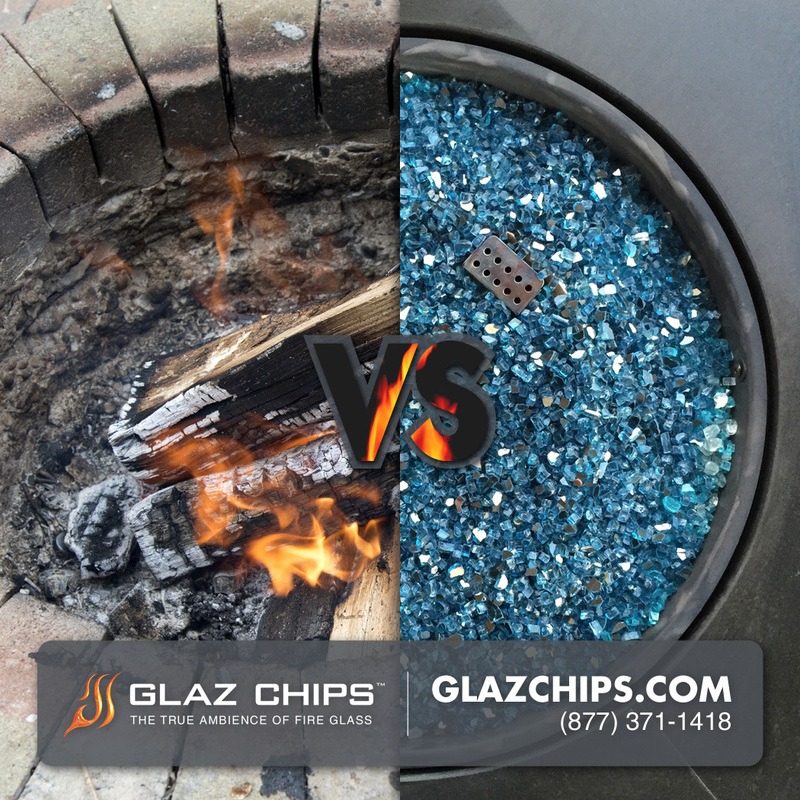 Glaz Chips Fire Glass can be used with fireplaces using natural or *propane gas. *Due to the chemistry of propane gas, it is advised to use darker colors if using propane appliances. Examples include glass colors such as black, bronze or dark blues. It’s only natural that you want to look and feel the product before making a purchase. With that in mind, we invite you to go to our Glaz Chips Fire Glass website and send us a message on what color you’d like a sample of. Or you’re more than welcome to call us Toll Free at (877) 371-1418 and talk to one of our customer service representatives for more information on how to obtain a sample or two. Answer : Every fireplace ranges and we’ve seen anywhere from 10 lbs to 65 /lbs or more worth of fireglass. To best answer the question visit our online fireglass calculator and enter the dimensions to best estimate how much your fireplace will need. Categories: design, fireplaces | Tags: construction, design, exterior design, fire bowls, fireglass, fireglass rocks, fireplace, gas firepit, glass in fire pits, glass in fireplaces, hearth products, holidays, home decor, interior design | Permalink.